The kids are heading back to school, and a new Congress is taking their seats (well, technically, our seats, though many of them quickly forget that fact). This means the holiday party season of Christmas and New Year’s is finally over. One of the things we do during party season is to select our beverages, both for ourselves and for our guests – and, as much as personal taste plays a role in that selection, the government plays a role as well. How much government do we want? How much government do we need? What should our federal, state, and local legislatures demand of us? And how should the executive branch – from federal departments and their agencies, to local zoning boards and liquor commissions – write the rules to enforce those demands? Let’s look at that most basic of purchases – our choice of champagne – as we consider the question. When we buy a bottle of wine, there are certain basic issues to consider first. If every bottle held different quantities (as with, say, potato chip bags), price comparisons would be tricky. So, the industry has standardized wine in two common sizes: 750 ml bottles, and the double-size 1.5 liter magnum, more common over here with still wines than with sparklings (there are other sizes too, like splits and demis, but they’re rarer). The standardization of the 750 ml bottle has made price comparison a breeze. The exact quantity has to be mentioned on the label (a label that’s been approved by the government), in visible, readable font, so that buyers know exactly how much they’re getting. Government involvement in the standardization of weights and measures has a long pedigree in the United States. Oddly, it started out in the State Department, and was one of the first subjects to be addressed by Thomas Jefferson, our first formal Secretary of State under the Constitution, in 1790. Different countries have different ways of interpreting such things; the metric ton and the English ton, for example, differ by 240 lbs. So, we have decided that the government should play a role in standardizing such terms, to ensure that buyers and sellers are talking apples and oranges. Okay so far. That much government involvement, we can all agree on, right? Depending on the person and the product in question, this may be a huge issue or a non-issue. The person making a purchase entirely on price – just looking for the cheapest available item – may not care about the origin of the product at all… but most of us do, especially with foods and beverages, and particularly with champagne. We may have a cultural or political reason for wanting to give our business to one country or another, or for wanting to deny it to an enemy. The Italian-American shopper may hope to buy an Italian wine, for example, the German-American consumer may want a German one. Or national pride may drive the buyer to seek a domestic choice; hundreds of years of winemaking in America, particularly in California, makes it easy to find an excellent domestic one as well. The government plays a role in this too, requiring that products be labeled with their country of origin. Every country has different rules about this issue. The United States regulations are in sync with most other countries in ordering that all importedgoods be clearly labeled with their foreign origin, but the USA is unusual in placing certain complex burdens on printing domestic origin claims (the world of country of origin marking regulations is therefore a particularly complex arena of trade policy). When the consumer sees an array of bottles in front of him, he wants to know, at a glance, which are French, which are Italian, which are American. Maybe he cares about the specific region of France or Italy, or the specific U.S. state. The regulations vary, again, from country to country; here in the U.S. you don’t have to say if the wine was made in California, Illinois, Wisconsin or Virginia, but you certainly can (though the government will be there to prosecute if you lie). Champagnes can range in price from $3.99 a bottle, all the way up to the thousands of dollars. The country of origin is just one of many factors that help the buyer determine whether that price is appropriate… and the government is there – through Customs, the FTC, the USDA, the ATF, and the TTB – to ensure that this bit of information is presented clearly and accurately. But champagnes get into even more complicated issues, some that are specific to champagnes. You’ll note that I’ve used the term “champagne” generically thus far. In common parlance, “champagne” is any sparkling wine. Period. But to oenophiles, it’s anything but. The two primary ways of making sparkling wine are the traditional method – in which secondary fermentation occurs in the bottle – and the charmat method – in which the secondary fermentation occurs in the tank, before bottling. To a wine connoisseur, this makes all the difference in the world. A proper champagne is one made by the traditional method, whereas a sparkling wine made the other way is a fake, a copycat. No matter how good it may taste, it’s not the real thing, and is therefore undeserving of the name (and by corollary, no matter how bad the real thing may taste, if it’s made the original way, it does deserve the name!). This presents a challenge in any such discussion, particularly for a writer. Should we use the broader term “sparkling wine” to be safe, or can we use the generic term “champagne” for both types? Governments have weighed in there, as well. Normally, governments protect brand names from being turned into generic nicknames. Even if we may use “kleenex” for facial tissue, or “coke” for carbonated cola in common parlance, the government has always supported protection in the form of trademark and copyright law. Champagne, however, gets into an unusual extension of that convention. The French insist that the term “champagne” can only be used for a sparkling wine made in the traditional method, grown in the Champagne region of France. This is a special privilege accorded to one small geographic locale, not only at the expense of the producers of the rest of the world, but even at the expense of fellow French wineries. There are plenty of wonderful French sparkling wines produced outside Champagne proper, but by being denied the right to use the name “champagne,” they cannot command the price they might objectively deserve for their product, based on quality alone. Still, that’s the French government’s choice, not ours. If they want to play favorites between their own regions, they can. Surprisingly, though, the French have been remarkably successful in also convincing other countries to accept this requirement. 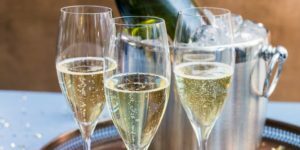 The European Union standardized their rules early on, requiring that all other European makers of sparkling wines honor the rule limiting the word “champagne” to the products of that one, original locale. Italian spumantis, Spanish cavas, etc. are forbidden from calling themselves “champagnes,” to join in the protection of the products of that one small French area. Even countries outside the EU have joined in, bit by bit, over the years. The U.S. agreed to a partial limitation on the wording a century ago, just after World War I, and clarified the rule in more detail just a decade ago. So it is that, here in the U.S., products that already bore the name “Champagne” or “California Champagne” might therefore be grandfathered in, but no new ones can bear the term. And just to be sure no mistake is made, even the ones that fall under the exception must somehow show the buyer that it’s not really from the Champagne region of France, so they name their state of origin, and identify whether it’s made by the traditional method or the charmat method. This poses a challenge for the marketing group of the company selling the product. Added to the usual marketing challenges – how to design an ad campaign, website, and labeling approach that will best sell the product – they need to consider these complex regulations. Added to the basic requirements that were already set by the government – identification of country of origin, alcohol content, and quantity, for example – every time such a treaty bound the U.S. to a new interpretation, or an added layer of complexity like this, regulators have had to consider how to build these treaty agreements into their regulations. When the State Department or U.S. Trade Representative signs a treaty that touches such issues, in WTO agreements or Free Trade Agreements, for example, it falls to these other agencies – Customs, FTC, FDA, ATF, and TTB – to build in regulations that apply them in a manner that won’t present the marketplace with incomprehensible rules to follow. Even all the information we’ve discussed here may not be enough to satisfy the needs of every consumer. This writer, for example, has a chardonnay allergy, and must therefore buy wines made of other grapes. This is easy for still wines, but presents a special challenge for sparklings. Almost all available sparklings contain at least thirty or forty percent chardonnay. Winemakers can choose to name the grape – or the blend of grapes – on the label, but most don’t. It therefore falls to the buyer to reach out to the winemakers to ask about the contents, most of the time (after just a few emails, for example, I found an affordable sparkling pinot grigio blend, though an oenophile might cringe at my calling it a “champagne”). Should the government step in here, as well? With growing awareness of food and beverage allergies, the day may not be too distant when the government offers to “help,” and issues a requirement that every label, every ad, every commercial must state the exact blend of grapes in the bottle, as they require so much else. And then there are allergies to tannins, and sulfites, too, and even allergies to the oak in the barrels that better wines are aged in. Can government possibly demand that labeling address every possibility, every issue that any buyer might care about? They might want to, but is it even possible? This is the direction we’ve headed in, for decades now, making regulatory compliance ever more of a challenge for the business community. Imagine the cost of having to relabel an entire truckload of products – because they were imported with a piece of information that the government considered misleading, or because they lacked some information that the government considers imperative. This is, in fact, one of the major costs of international trade – the routine need to unload shipping containers, break down pallets, open up individual cartons, and add or correct hundreds, or even thousands, of labels that were wrongly or insufficiently generated by the foreign manufacturer or other vendor. This actually happens rather rarely with wine, because so much is done in advance to ensure its acceptability – but it happens all the time with other products. There are special labeling rules for food, for toys, or cars, for clothes, for household appliances; very few products are exempt from marking requirements entirely, and even the most basic country of origin marking rules can be confusing. Government is trying to help the consumer (and in our specific example, also to help one remote province of manufacturers, an ocean away). None of this is intended to do any harm at all… but it adds a burden of complexity to the business community. This is the tradeoff we have learned to accept, in a nation blessed with the trappings of the modern administrative state: every time the government wants to help, it creates some burden on the private sector, a burden that grows more and more complex with each passing year. Let’s return to the present, and the news of the day. Nancy Pelosi has taken the gavel, to lead the House of Representatives. Mitch McConnell remains Majority Leader of the Senate. And Donald Trump remains head of the executive branch – the one that enforces all the legislature’s laws – for (at least) two more years. Congress passes laws that create the big picture of new rules, and then the executive branch works out how to apply them. New state legislatures and governors dance the same dance at the state level. And even our localities work out how to enforce their own rules, which may, for example, govern the licensing of liquor sellers, the minimum age of their customers, and even the hours when such purchases may be made. The business community gets taxed ever higher, from income taxes to property taxes, from workmen’s comp to unemployment, and along with these pressures, must find ways to ensure that their products comply with an ever growing body of governing rules. We can only hope that the incoming legislators have learned from the past, and have listened to their constituents, and are able to see the big picture. When a trade negotiator, congressional committee or federal bureaucrat tries to help any group – no matter how well-intentioned such help may be – they add to the already huge burden on the business community. A century of such burdens has already driven so many businesses, even so many whole industries, to foreign shores. We are now trying to bring those businesses and injuries back, and seeing some welcome success, but it remains a challenge. Here’s hoping steady hands and wise heads win the day, at all levels of government, in the months and years to come. And then we will truly have something to celebrate, with whatever kind of “champagne” you like! John F. Di Leo is a Chicagoland-based Customs broker and trade compliance trainer, actor and writer. His columns appear regularly in Illinois Review. This column was first published in Illinois Review, here.